Supreme x Hot Wheels collab drops this Thursday. Supreme’s Spring/Summer 2019 collection rolls along this Thursday, April 18 with the release of the highly anticipated Hot Wheels collab. 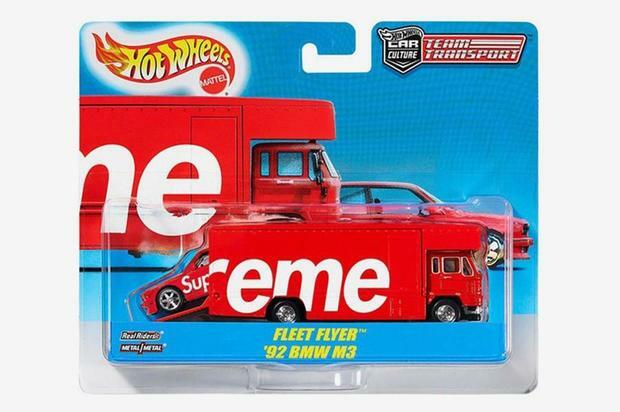 Of course, the toy truck and car won’t be the only Supreme item up for grabs on Thursday morning, but it’s already shaping up to be one of the most coveted releases of their S/S 19 campaign. The Supreme x Hot Wheels Team Transport pack includes a red Supreme-branded scale model Fleet Flyer, which carries a 1992 BMW M3. The Beamer comes complete with custom license plates while the classic Hot Wheels logo is stamped on the packaging. The Supreme x Hot Wheels collab, reportedly priced at $24, will be available online and at Supreme’s brick and mortar stores in Manhattan, Brooklyn, Los Angeles, London, and Paris this Thursday, April 18.